With a turnaround time of 4 weeks you only need 4 S1s 1046-1050 to provide for launches for an entire year period. During the next year we may see just a couple more S1s built. This includes a center core FH version and another core possibly a second FH as insurance or for customer that demands a new core (and pays extra for it). They're not going to shut down because an ASDS breaks down or for any other reason they don't recover a core. They're also not going to ignore the possibility that the methane fleet could take longer than anticipated. There will be plenty of boosters built. The one variable unknown is number of launches before major overhaul. 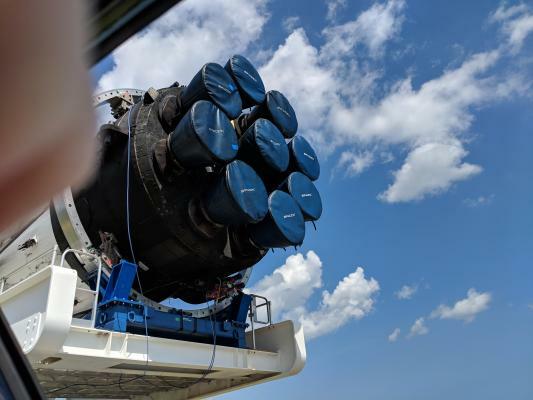 From comments by SpaceX that number could be the target of 10 but until several boosters have done 10 or more it is still an unknown that can not be planned on. We can speculate that 4 is plenty which assumes a reuse number 5+. Last time I heard Elon speaking on the subject, he said that he anticipated there being a need for between 30 and 50 block 5 boosters. Given that they started at 1046, 1080 would be within that range, so assuming the plans are unchanged since he said that, it's possible you may be right. The booster moving on 401. It seems the transporter ring at the back does not support a transport with legs still attached. The clearance between the rocket body and the transport ring seems too small. It doesnt look like this should be a big problem but maybe there are aspects that are more complicated than just changing the metal ring. No, that transporter can do it. This has been discussed before and the consensus always has been that there is clearance. The ring is outward from the body at that point. Did you see those prior discussions? what do you think is flawed in their analysis? or are B5 legs bigger? Aside from the fact that I've already seen that transporter doing it, to clear things out, the ring has waaaaaaaay enough clearance, the only thing from those legs that's under it is the locking mechanism at the base of them. I've did this... thing on Paint (yes, I know, not really professional, but that's the best I can do) to help see it clearly. From the last picture on that post you can see there's a distance of at least 40cm or so (by comparing it with the size of the engines) from the ring to that part of the legs which is enough to fit the locking mechanism there. Yeah, I remembered the discussion but forgot the outcome. Seems I should have looked before posting. To me the clearing looks tight, maybe even too small but if consensus was that its enough I guess I dont have much choice but to accept that I am wrong on this one. I dont have any definitive numbers on the leg thickness and from the images I have seen, its hard to guestimate their size. Its an easy fix anyway to change the support ring. - It really is in MUCH better shape than previous cores. - the flexible engine skirt material seems to have changesd, looked like fabric before but now it is different. - the flexible engine skirt material seems to have changes, look like fabric before but now it is different. 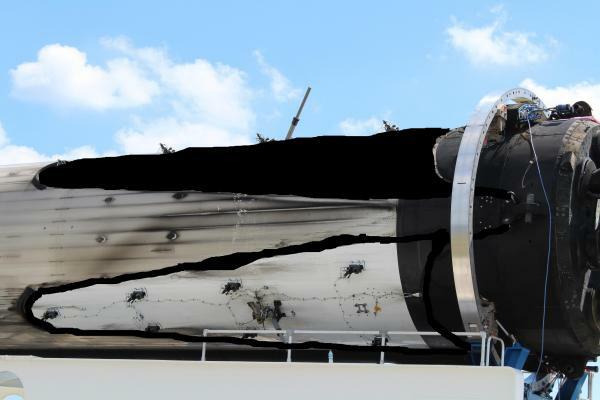 I wonder if they are heatshield plates made from the same or similar material as the base of the f9, you can see on the opening for the two nearest engines that they are fixed to the engine and the move with it (top left you can see a gap then the closest the plate overhangs the opening), i suspect those fabric boots still exist but behind this new plate which prevents most of the prolonged reentry gas on the fabric. Right, I see that now. Each engine has a plate that shifts around. Smart!